After about 3 weeks here, we’re ready to move on. We fly to Cape Town tomorrow at noon. Today we got up at 4am and once again drove down to Kruger National Park. This time, while we again started at the Orpen gate, we meandered south from there instead of north as we did last week. 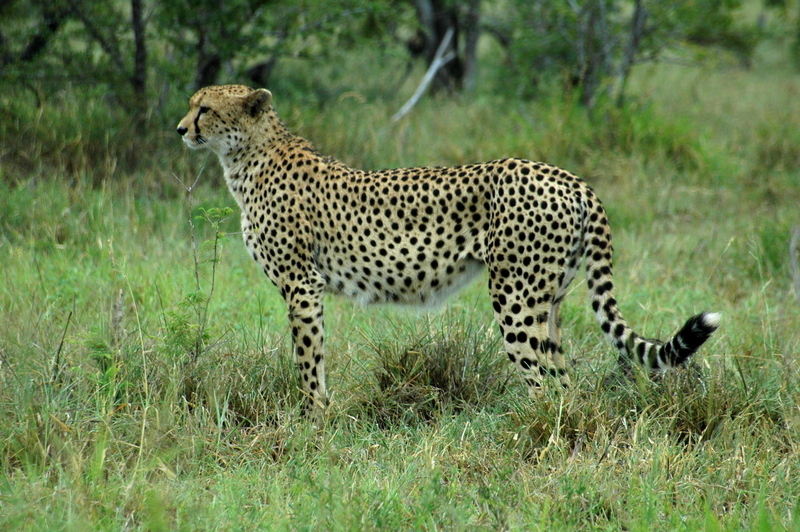 Not long after we entered the park, I caught sight of a cheetah! Very cool. We believe it was a female hunting alone. I happened to bump into the local manager of the BushGlam residence while I was posting this and showed her the photo above. She said that the cheetah appeared as if she’d just eaten or was pregnant. Since it appeared to us that she was hunting while we were watching her, we’re guessing she was pregnant. Doubly cool! Not long after our cheetah sighting, and after seeing lots of elephant dung on the road, I saw two juvenile elephants (no longer babies, but not fully grown) run across the dirt road a ways in front of us, crossing from right to left. They were moving pretty fast, so I slowed the car and we cautiously approached the area. 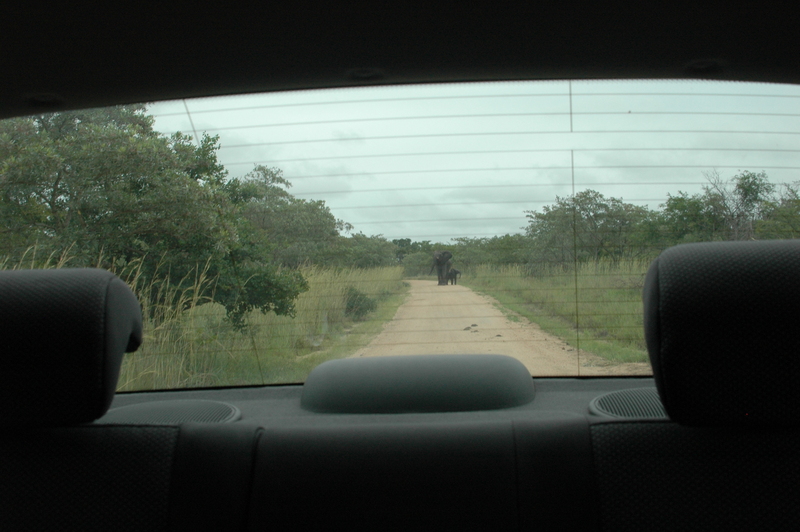 We saw a few elephants on the left side of the car and a few on the right side, a bit closer to us. All were partially obscured in the trees and not terribly close to the road. With our windows rolled down, we inched forward so we could see a bit better and then we heard an elephant trumpet in the trees on our left (by the way, this is the 3rd time we’ve heard that but the kids haven’t posted about our earlier episodes). The trumpet didn’t sound that close to us, so while our pulses quickened a bit, we didn’t completely freak out (I vaguely remember hearing “Go dad, Go”). We continued moving slowly forward and since we were not as close as we’ve been to elephants several other times, we didn’t even take any pictures. After a few minutes, as I started to accelerate and leave the trees, I looked in my rear view mirror and saw an elephant charging down the road at us! This wasn’t any false charge… and she had a baby elephant keeping pace with her as they came straight for us! We heard her trumpeting too. I pushed down the accelerator, but even though the car was apparently going faster, the mother wasn’t getting any smaller in my mirror! A few seconds and lots of adrenaline later, she thought we were scared enough (we were – the kids were looking over their shoulders and skwawking a bunch; I was busy trying to pedal faster (ala Fred Flinstone)), she left us alone and they calmly stood in the middle of the road. In all the excitement, we neglected to get a great photograph of our near miss, but we did get one after we were a very safe distance away. Here she and the baby are, triumphantly watching us scurry away. 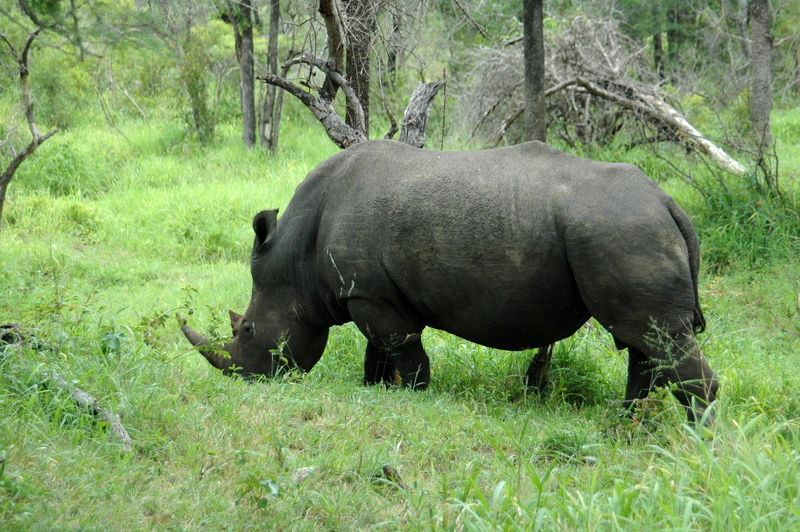 The last excitement for today was our first Rhino sighting in the Kruger park… all this before lunch. Totsiens Hoedspruit, hallo Cape Town!